Find out what time the Lights come on today with our handy guide to daily switch on times for 2018. 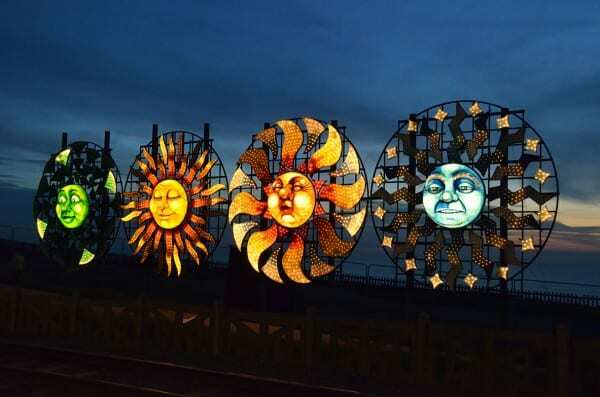 These are the official daily lighting up times for when Blackpool Illuminations switch on and off each day during the 2018 season. Each week the Illuminations lighting up time gets slightly earlier, as it gets dark earlier and the nights get longer. Think about it in blocks of a week. When there’s a time change it’s from Friday night until the following Thursday. At the end of British Summer Time when the clocks go back an hour, the Lights are turned on at 5pm. On Friday and Saturday nights the Lights go off at midnight. On Sunday night switch off time is 11pm. From Monday to Thursday they are turned off at 10.30pm – except during October half term week when they stay on until 11pm. Traditionally the Illuminations always used to finish on the last weekend of October half term. An extra week was added in 2014 and was so successful that it’s been continued. They always start on the Friday at the end of August bank holiday week. The switch on times for each day of the season are listed individually in the Events Calendar.  You’ll also find hundreds of other things there to do on the Fylde Coast. LightPool digital projection shows take place at regular intervals during each evening. 31st August Friday ** 8.45 p.m. to 2.00 a.m.
1st September Saturday 8.00 p.m. to 12.00 a.m.
2nd September Sunday 8.00 p.m. to 11.00 p.m.
3rd September Monday 8.00 p.m. to 10.30 p.m.
4th September Tuesday 8.00 p.m. to 10.30 p.m.
5th September Wednesday 8.00 p.m. to 10.30 p.m.
6th September Thursday 8.00 p.m. to 10.30 p.m.
7th September Friday 8.00 p.m. to 12.00 a.m.
8th September Saturday 8.00 p.m. to 12.00 a.m.
9th September Sunday 8.00 p.m. to 11.00 p.m.
10th September Monday 8.00 p.m. to 10.30 p.m.
11th September Tuesday 8.00 p.m. to 10.30 p.m.
12th September Wednesday 8.00 p.m. to 10.30 p.m.
13th September Thursday 8.00 p.m. to 10.30 p.m.
14th September Friday 7.45 p.m. to 12.00 a.m.
15th September Saturday 7.45 p.m. to 12.00 a.m.
16th September Sunday 7.45 p.m. to 11.00 p.m.
17th September Monday 7.45 p.m. to 10.30 p.m.
18th September Tuesday 7.45 p.m. to 10.30 p.m.
19th September Wednesday 7.45 p.m. to 10.30 p.m.
20th September Thursday 7.45 p.m. to 10.30 p.m.
21st September Friday 7.30 p.m. to 12.00 a.m.
22nd September Saturday 7.30 p.m. to 12.00 a.m.
23rd September Sunday 7.30 p.m. to 11.00 p.m.
24th September Monday 7.30 p.m. to 10.30 p.m.
25th September Tuesday 7.30 p.m. to 10.30 p.m.
26th September Wednesday 7.30 p.m. to 10.30 p.m.
27th September Thursday 7.30 p.m. to 10.30 p.m.
28th September Friday 7.15 p.m. to 12.00 a.m.
29th September Saturday 7.15 p.m. to 12.00 a.m.
30th September Sunday 7.15 p.m. 11.00 p.m.
1st October Monday 7.15 p.m. 10.30 p.m.
2nd October Tuesday 7.15 p.m. 10.30 p.m.
3rd October Wednesday 7.15 p.m. 10.30 p.m.
4th October Thursday 7.15 p.m. to 10.30 p.m.
5th October Friday 7.00 p.m. to 12.00 a.m.
6th October Saturday 7.00 p.m. to 12.00 a.m.
7th October Sunday 7.00 p.m. to 11.00 p.m.
8th October Monday 7.00 p.m. to 10.30 p.m.
9th October Tuesday 7.00 p.m. to 10.30 p.m.
10th October Wednesday 7.00 p.m. to 10.30 p.m.
11th October Thursday 7.00 p.m. to 10.30 p.m.
12th October Friday 6.45 p.m. to 12.00 a.m.
13th October Saturday 6.45 p.m. to 12.00 a.m.
14th October Sunday 6.45 p.m. to 11.00 p.m.
15th October Monday 6.45 p.m. to 11.00 p.m.
16th October Tuesday 6.45 p.m. to 11.00 p.m.
17th October Wednesday 6.45 p.m. to 11.00 p.m.
18th October Thursday 6.45 p.m. to 11.00 p.m.
19th October Friday 6.30 p.m. to 12.00 a.m.
20th October Saturday 6.30 p.m. to 12.00 a.m.
21st October Sunday 6.30 p.m. to 11.00 p.m.
22nd October Monday 6.30 p.m. to 11.00 p.m.
23rd October Tuesday 6.30 p.m. to 11.00 p.m.
24th October Wednesday 6.30 p.m. to 11.00 p.m.
25th October Thursday 6.30 p.m. to 11.00 p.m.
26th October Friday 6.15 p.m. to 12.00 a.m.
27th October Saturday * 6.15 p.m. to 12.00 a.m.
28th October Sunday 5.00 p.m. to 11.00 p.m.
29th October Monday 5.00 p.m. to 11.00 p.m.
30th October Tuesday 5.00 p.m. to 11.00 p.m.
31st October Wednesday 5.00 p.m. to 11.00 p.m.
1st November Thursday 5.00 p.m. to 11.00 p.m.
2nd November Friday 5.00 p.m. to 12.00 a.m.
3rd November Saturday 5.00 p.m. to 12.00 a.m.
4th November Sunday 5.00 p.m. to 11.00 p.m. These are the official daily switch on times provided by the Illuminations department. In the late summer months of September you’ll enjoy walking around on warm evenings, looking at the bright lights. Stop for a bucket of candy floss and enjoy all the lovely seaside sights, sounds and smells. Then as the weather gets colder, a trip to the seaside in the cool autumn air is a must! 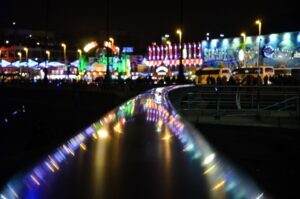 We all enjoy going out on the promenade, wrapped up in warm winter clothes, enjoying the brilliant Blackpool Illuminations and making memories for the future. With our handy table of daily switch on times, you’ll know just when to head to the seafront. Why don’t you bookmark it? 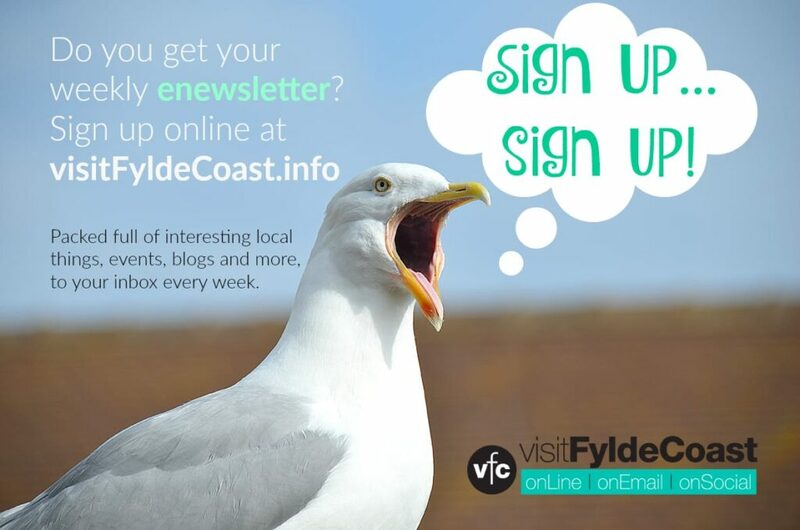 If you love Blackpool and the Illuminations you ought to sign up for our weekly email newsletter. It’s packed full of interesting things and will arrive in your inbox all 52 weeks of the year. 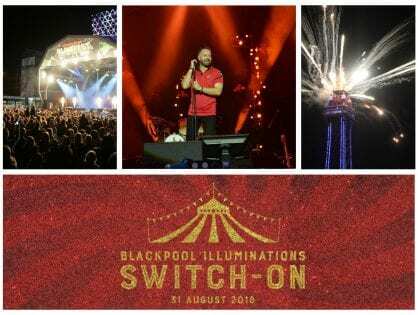 You’ll find lots of photos on our Live Blackpool Facebook page why don’t you share yours! The Illuminations don’t go on again until next summer. Wednesday14th Nov I see that the lights are on again well passed the end date. How long will it be before they are on24hr x7 x365. Has Blackpool no concern for the cost or even the planet?. I’m sure there’s a reason for them being on. 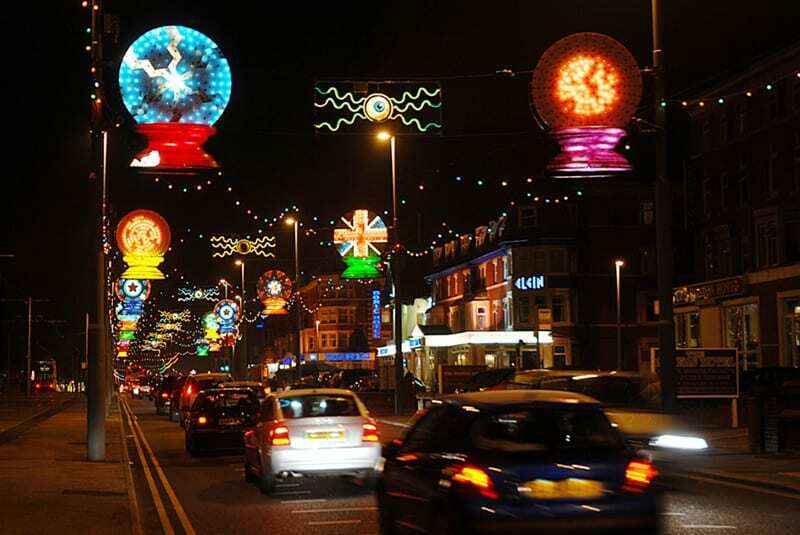 I have booked a family room for nov 23rd 2018 , it is a weekend break and I want to know if any of Blackpool Xmas lights will be on , or will there be any lights on at all . Hi Leanne, Blackpool Christmas Lights begin on Saturday 1 December. Blackpool is always bright and lively all the year, but I’m afraid there won’t be any actual Illuminations shining.